The 5th Annual Houston Iftar Ramadan Dinner with Mayor Annise Parker showed, this year again, a beautiful portrait of Brotherhood where all races and religions shared and enjoyed peacefully under one roof. 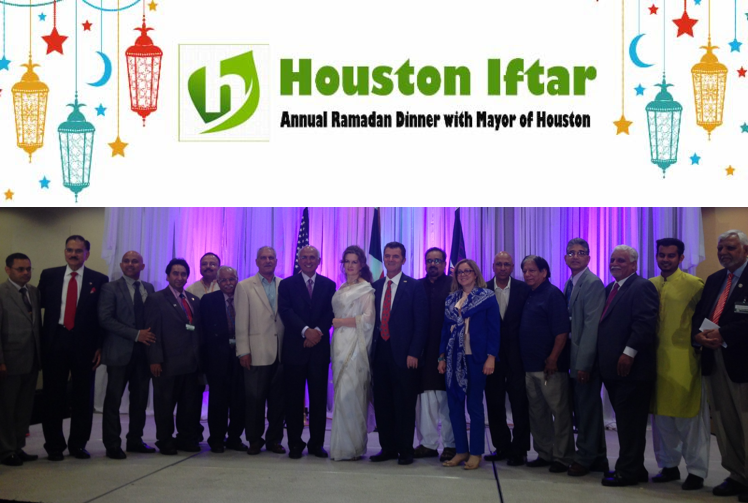 On Sunday, June 28th 2015, Houston Iftar gathered together several communities with members of all faiths and denominations to break the daily fast during this prestigious dinner at the Bayou City Event Center. Over 1,500 people attended this meaningful event organized by the Abu Dhabi, Baku, Basrah, Istanbul and Karachi Houston Sister Cities Associations and the Islamic Society of Greater Houston hosted by collaborating organizations such as His Highness the Aga Khan Council for the Southwestern United States, Raindrop Turkish House, Azerbaijan Center, Pakistan Chamber of Commerce-USA, the National US-Arab Chamber of Commerce, Interfaith Ministries for Greater Houston, the Council on American Islamic Relations Texas Chapter, the Hashoo Foundation, and many others! The Mayor of Houston and other Congressional, County, City, business, civic leaders and Members of Consular Corps of Houston also attended the multi-cultural event to show their support and solidarity. The event began with a recitation of the Holy Qur’an by Zara Khan followed by a speech on Human Values in Islam by Imam Imad Enchassi, President of the Islamic Society of Greater Oklahoma City. Mr. Muhammad Saeed Sheikh, Coordinator at the Houston Iftar Organizing Committee and President of the Houston-Baku Sister City Association greeted all the guests and expressed his gratitude to all Elected Officials, Dignitaries, sponsors, volunteers and attendees for honoring us with their presence. Congresswoman Sheila Jackson Lee followed by Congressman Al Green gave their remarks on the importance of tolerance and respect between all humans. Both congressional representatives whose districts are located in Houston, also greeted the audience and presented proclamations to the organizers of the dinner for their hard work towards creating a more diverse and bonded society. All the volunteers at this event were a perfect representation of diversity and unity! Both congressional representatives recognized all distinguished guests and representatives including several members of the Consular Corps and thank them for their presence and support. Jihad Turk, President of Bayan Claremont Islamic Graduate School, shared his knowledge on the significance of Ramadan before handing over to M.J. Khan, President of Islamic Society of Greater Houston. Through a video message, Governor of Texas Greg Abbott greeted the guests on the occasion. The Mayor of Houston Annise Parker was introduced by the Guest of Honor and major sponsor of Houston Iftar for the past four years, President and CEO of Midland Energy & Petroplex Energy. Keynote address was made by Mayor Parker who highlighted the importance of solidarity and diversity as foundations of the City of Houston while addressing the full banquet hall. The Mayor also made emphasis on the wonderful work that all Sister Cities are able to accomplish together. Representative Sylvester Turner and Representative Gene Wu also joined the stage to greet the participants and present their best wishes of health and prosperity for this Holy month of Ramadan. For the breaking of fast, the invocation was quoted by Imam Tauqer Shah from the Maryam Islamic Center. The program was followed by a dinner for all to share. All communities were proud to be a part of this symbolic event and look forward to the next ones to come. On behalf of the Houston Iftar Organizing Committee, we would like to express our sincere gratitude to all volunteers, participating organizations and generous sponsors for their strong support! You are the reason why this meaningful event exists! Ramadan is the 9th month of the Islamic calendar, is the month of fasting. During the entire month of Ramadan, Muslims are obligated to fast every day from dawn to sunset. Fasting helps to teach patience, self-control and humility. In the Holy Month of Ramadan, Muslims give in extra acts of charity, spend extra time in worship, forgiveness for sins in the past, pray for direction and assistance in abstaining from everyday troubles, and endeavor to cleanse themselves through self-control and great acts of faith.